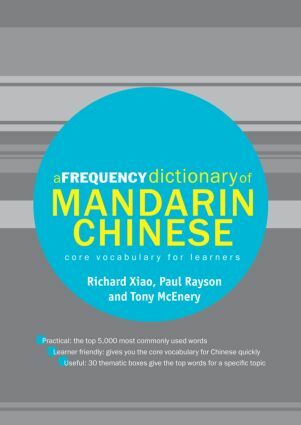 A Frequency Dictionary of Mandarin Chinese is an invaluable tool for all learners of Mandarin Chinese, providing a list of the 5,000 words and the 2,000 Chinese characters (simplified) most commonly used in the language. Based on a fifty-million-word corpus composed of spoken, fiction, non-fiction and news texts in current use, the dictionary provides the user with a detailed frequency-based list, as well as alphabetical and part-of-speech indexes. All entries in the frequency list feature the English equivalent and a sample sentence with English translation. The Dictionary also contains thirty thematically organized lists of frequently used words on a variety of topics such as food, weather, travel and time expressions. A Frequency Dictionary of Mandarin Chinese enables students of all levels to maximize their study of Mandarin vocabulary in an efficient and engaging way. It is also an excellent resource for teachers of the language.